Only a few restaurants strictly adhere to the no smoking policy as required by Greek law. Only a minority of Athenian restaurants impose the smoking ban that came into effect in 2009. “Where can I find a restaurant that sticks to the smoking ban in this city?” This exasperated and slightly angry question from a friend from abroad who had visited Athens on holidays was the most recent I’ve heard on that subject from other acquaintances. I’d seen them on Facebook posts, in questions on TripAdvisor forums and among conversations with young parents who want to go for dinner without their children choking on cigarette smoke. I knew that there were some restaurants that strictly adhere to the no smoking policy as required by Greek law. It was a good opportunity to applaud some of these heroes who comply with the law, despite the fact that the majority of their colleagues flout it, unchecked and without any penalty. Consumers are held hostage to a policy that was voted into being and advertised as the law, but never enforced, with the crisis being blamed for the authorities turning a blind eye so that businesses wouldn’t lose their custom in Europe’s number one country for smokers. The result? A scenario of unfair competition in the field of restaurants (bars, clubs and bouzouki venues are not even worth bringing up since the smoking ban is never enforced there), where the business people who play by the rules are made to feel like fools. The unfair competition beings with the state, which allows the infringements of the ban go unchecked, and of course we feed it as customers through the choices we make. “Nice place, but if they ban smoking, I won’t be coming back,” a friend recently told me about a restaurant we visited where we could smoke freely. In short, this otherwise steadfastly modern, European friend of mine was ready to punish a legitimate business owner for obeying the law and was willing to give her money to those who break it. Don’t get me wrong. I’m a smoker who enjoys a cigarette before and after a meal as much as anyone else. Just as I enjoyed it in the office too, before our employer banned us from smoking. At first, it seemed like the end of the world ‒ “We’ll have to write without smoking? Who ever heard of that?” ‒ but soon I discovered the magic of a clean workplace, which I would trade for anything. In short, everything is a habit, which initially must be imposed, recognized by others, taken up and ultimately enjoyed. This is what we hoped would happen with restaurants when the law first come into being on July 1, 2009. But seven years later, compliance with the law is the exception and the entrepreneurs who uphold it often pay dearly. While there are many restaurants that apply the ban, they are still the minority. Facebook groups exist in Greek for those looking for non-smoking restaurants, suggesting it’s an important factor for many. That is why some (but not many) businesses have taken the plunge. Many restaurants may prohibit smoking at the tables but they allow it at the bar in the same space, thus defeating the purpose. Some have created separate smoking areas for smokers, but not everyone can do that. When I found him near his restaurant, Varoulko Seaside, surrounded by eateries that allow smoking in spaces facing the sea, it became clear what he meant. “I applied the ban from day one, but laws in Greece seem to last for 10 days. And how else it could be, since no one controls anyone? Look at the government budget for last year. The revenue generated by from fines collected from the anti-smoking law is zero. Nobody intends to check you, so few apply it. “We can’t fool around with health matters,” said Chrysanthos Panas of freshly renovated opened Zonar’s, a restaurant lounge bar in the city centre that strictly complies with the ban. “It’s not only an aesthetic issue, it’s a health issue. How can someone play around with it? There could be members clubs for smokers, as there are for cigar fans. “One night, a gentleman lit a cigarette inside the restaurant and when we politely asked him to extinguish it, he said ‘Call the police, I’m not putting it out,’” recalls Evdoxia Pantou, owner of To Mavro Provato, which applies the ban in both its restaurants, located in the Athens districts of Pangrati and Melissia. “At first it was difficult, a daily battle, now it’s better. I consider it civilized to not smoke in the area where you eat. Other owners agree, despite their own habits. 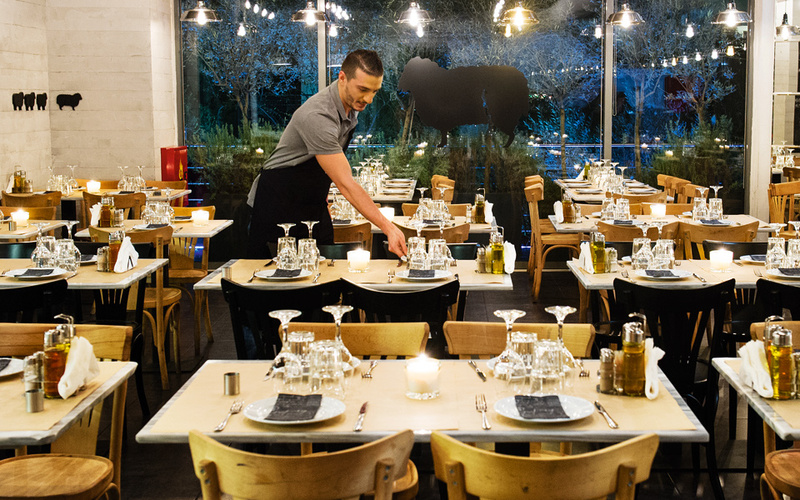 “Everyone in the restaurant, owners and workers, is a smoker,” says Susana Tsioti, owner of Aglio, Olio & Peperoncino, a well-known Italian restaurant in Koukaki, near the city centre. “But we applied the law from day one, because even we were fed up of the atmosphere created in the restaurant by the cigarettes. Afterwards, it changed completely. “We create our dishes with love and care, we spend time on them, we want people to enjoy them properly. Often we’d take the dish over and because the customers were smoking, they ate it cold. Of course, in the beginning there were reactions and we lost customers. Even now some people cancel their reservations when they hear that smoking is not allowed. But we won others, especially on Sundays, when people come with their children. And if you think that only luxury restaurants uphold the law, you’re wrong. Papasideris taverna, a legend among those who know how to eat well and live or work in the central Athens district of Ambelokipi, is an excellent example, since it’s one of the places where the law is most rigorously enforced. Yiannis Ikonomou, the owner and an avid cigar smoker, has even made relatives go outside if they want to smoke from the very first day that the law came into effect. “I’m a smoker, but I have never smoked in the bedroom. Why would I smoke in the restaurant? The restaurant is completely different without cigarette smoke. Even with two vents, we were choked with the smoke in here. I applied the law from day one and was thrilled with the result.